Despite fighting deeply rooted patriarchal structures, for decades Palestinian women have played an integral role in resistance. Without the prioritization of the emancipation of women, national liberation will not be achieved. In his book about the village of Baqa al-Gharbiyeh, the Palestinian historian Subhi Biyadseh recalls an event the villagers relayed to him. During the British Mandate era in Palestine, the English had shelled the village of Baqa al-Gharbiyeh in 1936. The army then took all of the men of the village prisoners, which resulted in the women descending upon the military barracks at night with their children, armed only with rocks, demanding the army's release of their men, which they succeeded in achieving. This episode highlights the role Palestinian women have so prominently engaged in when it comes to resistance against the foreign occupation of Britain and then Israel. It is also a testament to the fact that women in resistance have been an integral part of the struggle against the ongoing colonisation of Palestine. This contradicts a lazy type of sensationalist media reportage on the topic, that depicts women either as anomalies in patriarchal Palestinian society or as somehow relatively new phenomena. The participation of Palestinian women in the national struggle started with the emergence of the Palestinian cause towards the end of the nineteenth century, when the first Jewish colonies were built. The first remarkable female political activity was in the town of Afula in 1893, when women demonstrated against the construction of a new Jewish settlement. The British mandate era (1917-1948) saw the establishment of charitable organisations and an increase of social work, as well as their political participation in demonstrations. Following the killing of nine Palestinian women in the 1929 Western Wall riots in Jerusalem, the first Arab Women’s Association was formed, in addition to the Arab Women’s Union. These unions embarked on several economic, social, cultural, and national efforts, such as planning and organising demonstrations and writing letters to Arab leaders to support Palestinians. In their active resistance against the British Mandate and Zionism, Palestinian women were not confiend to their supportive relationships to a man as a wife, a daughter or a sister. These women bore a major responsibility for sustaining armed resistance largely undertaken by men by trading in/selling their jewellery for rifles, as well as supplying food, arms and information to the fighters. Armed women's organisations also existed, such as Zahrat al-Uqhawan (the Chrysanthemum Flowers), originally established as a social organisation in 1933 in the city of Yafa by the two sisters Moheeba and Arabiya Khursheed. The transformation into an armed group was a consequence of Moheeba witnessing a British Mandate sniper shooting in the head a Palestinian boy, who was in his mother’s arms. Zahrat al-Uqhawan were involved in fighting the Jewish armed gangs up until Yafa fell in 1948, where most of the city’s Palestinian population were ethnically cleansed, including Moheeba who lived out the rest of her life as a refugee in Jordan. The Nakba, or the ethnic cleansing of approximately 800,000 Palestinians (two thirds of the indigenous population) at the hands of Zionist terrorist militias, was augmented by the collapse of the Palestinian economy and social life. Until 1967, there was no formal organisation of women's unions, and the informal organisations were confined to the elite classes. Palestinian refugee women were tasked with performing social activities that were earlier rejected in rural areas before the Nakba, such as leaving their homes to earn an income through employment. Following the defeat in the June 1967 Six Day War, referred to as al-Naksa, as the West Bank, Gaza strip, the Golan Heights, and the Sinai all became occupied by Israel, Palestinian resistance escalated and took precedence over all forms of civil and social activity. Most of the publicly active women joined the Palestinian resistance factions and engaged in political work. The national participation of women continued in that period whether in armed resistance, social work, or in secret organisational work in the West Bank and Gaza strip, which produced several iconoclastic figures. 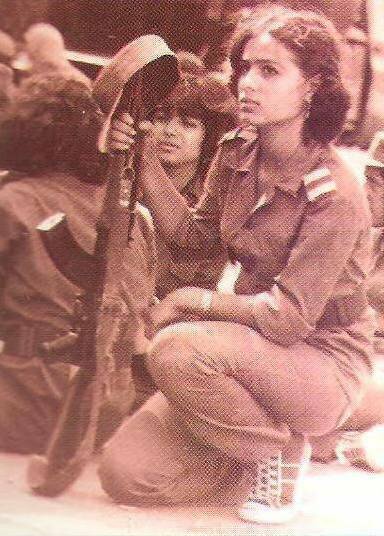 Shadia Abu Ghazalah, an active member of the Popular Front for the Liberation of Palestine (PFLP), is one example of some intrepid female participation in armed struggle. She had refused to leave Palestine and was killed in her hometown of Nablus in November 1968, at the tender age of 19, as the bomb she was preparing accidentally detonated. Leila Khaled, also a member of the PFLP, grabbed the world’s headlines, as she became the first Palestinian woman to hijack a plane in 1969, and again the year after. Dalal Moghrabi, a member of the Fateh armed wing, was killed in 1978 after hijacking a bus heading to Tel Aviv from Haifa in what came to be known as the Coastal Road operation. Ten other Palestinian militants and 38 Israelis were killed. The first Intifada ushered in a grassroots popular resistance to the violence of the Israeli occupation. Women demonstrated with men in large protests, and the former’s presence was seen as a deterrent to the arrest and brutal beating up of the latter at the hands of the occupation forces. Yet while the women’s role in the Intifada was recognised as crucial, their social status did not rise nor were they involved in political decision-making processes. The signing of the Oslo Accords in 1993 normalised relations with Israel, ended the popular uprising, and conceded national principles of self-determination, liberation and justice in exchange for a promised consolidation of political and economic power. Although women had been active in non-governmental organisations and civil society, female participation in the newly formed Palestinian Authority (PA) government was weak and marginalised. Their job opportunities were limited to those of secretaries, typists, or teachers in public schools. Women are still underrepresented in the leadership of the main Palestinian political parties despite high levels of political activism. The second Intifada was more exclusionary due to its militarisation, which resulted in the participation of women in suicide bombing and martyrdom operations. Ayat al Akhras, who lived in the Dheisheh refugee camp in Bathlehem, was only 18 years old when she detonated the explosive tied to her body outside a supermarket in Jerusalem in March 2002. According to a report by Amnesty International, Palestinian women hae been killed and injured by Israeli occupation forces either inside or near their homes, or while moving from one village to another. The report also says that some women died under the wrecks of homes demolished by the Israeli army. Other girls were killed by the occupation forces in their schools, such as 10-year-old Noran Deib who was killed in 2005 in her school playground in Rafah, Gaza. To date, since 1967 there have been 10,000 Palestinian women arrested. The majority is subjected to psychological torture and ill treatment throughout their arrest and detention, such as beatings, verbal abuse, strip searches, sexual harassment and violence. In addition to living in hazardous conditions and being deprived of visits most of the time, women are exposed to pressure and degradation due to interrogators' use of patriarchal techniques to elicit confessions. Interrogators and guards are often men, which contradicts international law, which specifies that women prisoners are to be guarded and inspected by female guards only. Pregnant detainees are given little to no pre- and post-natal care. A former prisoner Samar Sbeih was arrested when she was two months pregnant, and frequently threatened with abortion during her 18 hours a day interrogation, which lasted for 66 days in the infamous Maskubiya detention camp. When she was due, she was transferred to a hospital with cuffs on both her hands and legs and accompanied by guards; her hands were released only for thirty minutes during her forced caesarean delivery. Between 2000 and 2007, 69 women gave birth at military checkpoints, or were denied or delayed access to hospitals. As a result 35 newborn babies died. One particular heart-wrenching story is of Maysoon al-Hayek, who in February 2002 was stopped at Huwarra checkpoint on her way to Rafidiya hospital in Nablus with her husband and father-in-law. The car was allowed to drive only a few hundred metres before shots rang out. She lay on the floor of the car screaming and crying in pain and fear as the contractions got worse: neither her husband nor her father in law replied. She was injured in the shoulder from the glass and shrapnel. Soldiers came and made her take off all her clothes as she lay on the ground bleeding. They called an ambulance that took her to the hospital where she gave birth to her daughter in the elevator. It was only there that she learned her husband was dead, having been shot in the throat and the upper body, and her father in law was in a coma for 40 days after bullets penetrated his lungs. Currently, in addition to the Israeli occupation, Palestinian women face repression from the PA government in the West Bank and Hamas in the Gaza strip. Protests are often met with beatings, sexual harassment, and intimidation. But within youth movements and the weekly protests that take place in several West Bank villages, there is still very little understanding that national liberation can never be achived within a patriarchal structure. Women's emancipation must come during the process of liberation and resistance, not afterwards. It cannot be postponed. Hopefully, we can witness a change and effectively dismantle the non-representative Palestinian governments and the Israeli occupation in order to secure an inclusive future built on the foundations of justice and self-determination.